Check out this extraordinary abstract embroidery design that will be such a great enhancement for your favorite items! 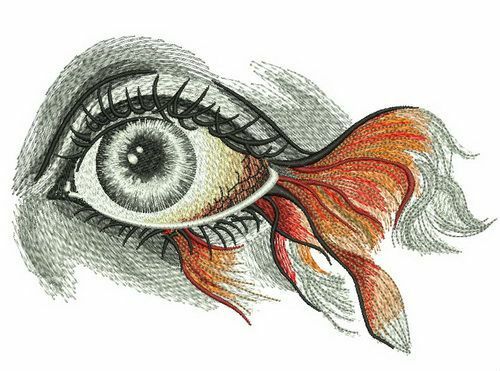 It features an eye of a woman with the long eyelashes evolving beautifully in a fishtail. The color palette chosen for this needlework perfectly amplifies the artistic intent. The mix of twilight, black, dogwood, beige, saffron and honey will look stunning on a darker monochrome background. Go ahead and decorate your favorite sweaters, jackets, gloves, purses, T-shirts or scarves with this beautiful design. The application is compatible with all kinds of fabrics.